Let’s face it; people want to be friends with pleasant people. Minding your manners is step toward workplace friendships. Why are friends at work beneficial? According to the Huffington Post, friendships in the office boost productivity and passion for the job. Despite what some think, being polite does not mean being a pushover. 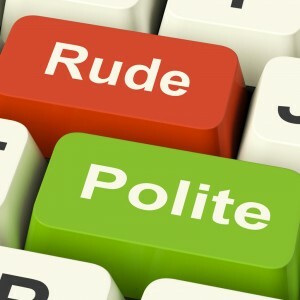 Rude people are difficult on many levels, but especially to work with! If you’re a polite teammate, you will become easier to work with, meaning more work can get done. Finally, but most importantly, good manners build your credibility as a professional. For example, if your boss trusts you can behave and act professionally, he/she will be more likely to give you bigger projects with different teams, clients and/or customers. Being polite at work is a must, regardless if you’re entry-level or an executive. Start the new quarter on a good foot with good manners! Have additional insight? Leave a comment! This entry was posted in Currently Employed and tagged be polite, be polite at work, Career Advice, manners at work. Bookmark the permalink.